A small friendly church, within a wonderful modern property, that was built in 2006, although a Methodist church has been here for 200 years. Strong community and ecumenical links. 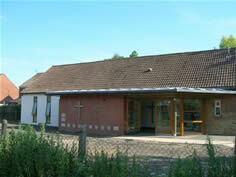 Ist Sunday Month: United service with Parish Church at Methodist Church: This is a café style service led by vicar – Rev. Martin Dale. 4th Sunday Month: United service at Parish Church. Worship space and small meeting room available for suitable hire.